The Regional Commission is the regional planning and development agency serving the communities of Middle Georgia. Services are provided in a wide variety of areas including Planning, Economic Development, Public Administration, Information Technology, Workforce Development and Aging Services. In 1965, the Middle Georgia Area Planning Commission was formed when Bibb, Crawford, Houston, Jones, Monroe, Peach, and Twiggs Counties voluntarily joined together. The stated objective of the Middle Georgia Area Planning Commission was to work towards the total development of the human, economic, and natural resources of the Middle Georgia area. By joining together, they created an advisory organization to provide member governments with technical services from professional staff in a variety of disciplines. In 1973, the Middle Georgia Area Planning Commission transitioned to the Middle Georgia Area Planning and Development Commission to reflect the added activity of economic development. Organizational bylaws underwent substantial changes to alter the membership of the Board, requiring for the first time that two-thirds of the Board membership be elected officials. The purpose of the Middle Georgia Area Planning and Development Commission and the services offered became even more encompassing to meet the needs of the member governments, which has always been a core goal of the organization. Additional staff was added primarily in the fields of planning and human services, which would later become the Area Agency on Aging. In 1978, Middle Georgia was designated by the U.S. Department of Commerce as an Economic Development District, allowing the provision of an array of economic development services to its member governments. In 1983, the Development Corporation of Middle Georgia was created as the lending arm of the organization and has since become known as the Georgia Small Business Lender. In 1989, the Middle Georgia Area Planning and Development Commission became the Middle Georgia Regional Development Center through the Georgia State Planning Act of 1989. The RDC was tasked with developing, promoting, and assisting in the establishment of coordinated and comprehensive planning in the State, and with assisting local governments in preparing and implementing comprehensive plans to develop and promote essential public interests. In order to meet the changing demands and requirements of its member governments, the RDC continued to expand its professional staff and technical expertise, including the field of GIS computer mapping and related technology services. For the first time since it was established, the boundary of the organization was modified in 1993, to include Baldwin, Jasper, Putnam, and Wilkinson Counties. Finally, in 1997 the current service area was established when Pulaski County was added and Jasper County was reassigned to the Northeast Georgia RDC. Once again, the time had come for the organization that began as the Middle Georgia Area Planning Commission to transition. 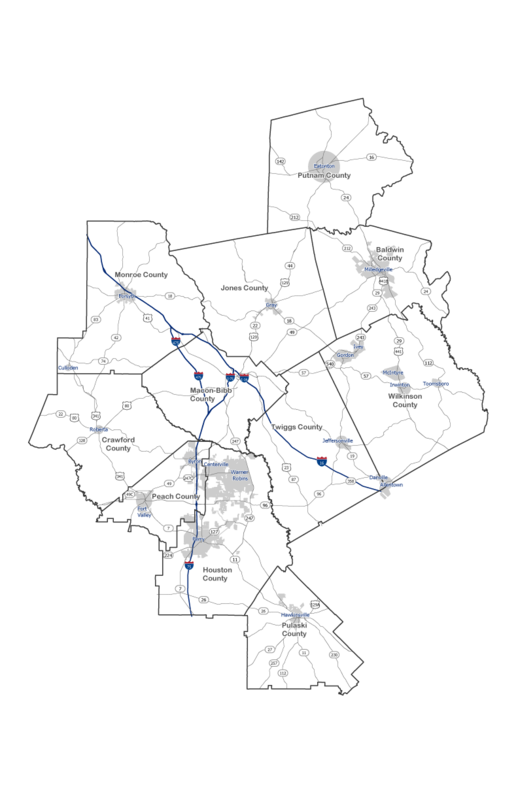 On July 1, 2009, the Middle Georgia Regional Commission was established. This was a result of the Commission for a New Georgia Service Delivery Task Force and subsequent legislation called House Bill 1216 (HB 1216). HB 1216 consolidated the number of regional development centers from 16 to 12, changed the name of the organization, and modified the governing body to include appointments from the Governor, Lieutenant Governor, and Speaker of the House. For the first time in our 44-year history, HB 1216 authorized Regional Commissions to provide direct services to local governments. In July 2013, at the request of the City of Macon and consent of Governor Deal, Middle Georgia Regional Commission added workforce development to the complement of economic development services. Although the organization has changed names, added new programs and new communities, the purpose and focus remains the same–service to local governments and citizens of Middle Georgia. The objectives of the Regional Commission are to develop, promote, and assist in establishing coordinated and comprehensive planning in Georgia; to provide local governments, on both an individual and regional basis, with professional technical assistance to improve local government service programs; to provide information technology-based services; to manage nonprofit corporations created by the Regional Commission in accor­dance with Georgia law for the operation of revolving loan programs and to function as a certified development company; to function as the designated Area Agency on Aging (AAA), responsible for services, advocating on behalf of older persons in need, and contracting with a network of agencies to provide direct services to the elderly in the Middle Georgia region; and to provide workforce development services in Area 10. 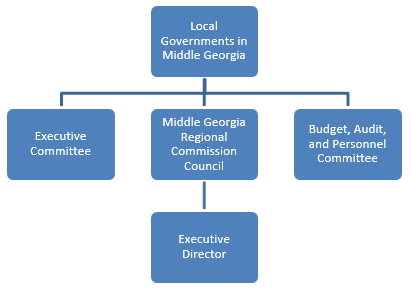 In accordance with State law, the Middle Georgia Regional Commission has a 60-member governing body known as the Regional Commission Council. The Council, through the Budget, Audit, and Personnel Committee, hires the Executive Director. The Executive Director is then charged with hiring staff for the Regional Commission. The Regional Commission Council is responsible for establishing policy and direction of the organization and the component units in accordance with state and federal laws.